What most people think of as being traditional Japanese food is sushi, but in fact, the dominant feature of Japanese cuisine is white rice. In fact, anything served with white rice is considered a side dish, which is present purely to balance and enhance the rice. In Japan, meals are listed on menus according to the number of side dishes they contain, so the simplest meal is called Ichiju Issai which translates as soup plus one, which actually means soup, rice and one side dish. This is often served at breakfast, when miso soup, rice and a vegetable like daikon (a kind of pickled carrot) would be eaten. Most meals are Ichiju Sansai or soup plus three: soup, rice and three side dishes each of which must be cooked by a different method. Usually one side dish will be sashimi or raw fish, one will be a grilled dish and can be meat or vegetable and one will be boiled and can be meat or vegetable. Sometimes a steamed, fried or pickled dish will replace either of the cooked side orders. All meals finish with green tea, unless they are banquets which end with sake, or rice wine. Many people are confused by Japanese cookery books, but when you understand the principle of Ichiju, it becomes clear, as you should have side dishes cooked by different methods, recipes are put in chapters according to the cooking method, not the ingredients. There are usually special chapters for sushi and pickles too. You can only make Japanese food with true sushi rice, which is short grained and sticky. It is used to make both sushi and onigiri (rice moulds with a savoury or sweet filling, often taken for lunch in the way Westerners take sandwiches - a Japanese lunchbox is called a bento). Sushi rice has to be washed in cold water until it runs clear, then left to soften in a colander for twenty minutes. It should be cooked in twice the quantity of water to rice, by simmering for ten minutes and then turning off the heat under the lidded pan and leaving it to sit for a further ten minutes in the pan. Many Japanese families use a rice cooker to prepare perfect rice. In the West, people think sushi means raw fish, it doesn’t. Sushi means vinegar rice, which is simply rice cooked as above and then folded gently with some specially seasoned rice vinegar and used to make rolls with a variety of ingredients from raw fish to vegetables to fruit and meat and cooked egg. 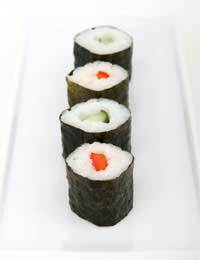 Sushi comes in a range of styles from nigri which are bite sized ovals topped with seasonings, to maki, which are rolls of nori seaweed filled with rice and fish or vegetables. Various fillings such as tinned tuna, cooked asparagus, grilled and skinned pepper, avocado etc. Take about a tablespoon of vinegar and fold it into the cooked rice with a spatula so as not to break the rice. Don’t put the vinegar in a metal bowl or use a metal utensil to stir as it has a chemical reaction that tastes awful. Dip your hands in ice water and lay some rice on a sheet of nori on the maki mat. Lay fillings on top, in the centre of the sheet and making a long line from end to end of each one. Use the bamboo mat to roll up the sushi and keep using the mat to both shape and compress the roll into a perfect cylinder, now lift the top edge of the mat and run a finger of ice water along the nori so that when you roll it closed again the nori will stick to itself like an envelope. Slice into thick slices, dipping your knife in cold water between each cut so that the rice does not stick to the blade and spoil the shape of the sushi. Serve on a decorative plate.